VEMOX is the ultimate entertainment app for the Hispanic family, providing access to the best Spanish-language and English-language content available, with more than 100 live channels and over 30,000 hours of On Demand content. As the ultimate OTT solution, VEMOX helps maximize acquisition and retention efforts from broadband services, reduces churn, and presents the opportunity to extend services to new and growing market segments. Reduce operators’ upfront investment costs with our turnkey OPEX model, saving time and money. Capture and monetize new broadband subscriptions from non-Pay TV households. Extend the subscribers’ entertainment experience to any device: Android & iOS Devices, Amazon Fire TV, and Smart TVs, including LG and Samsung. 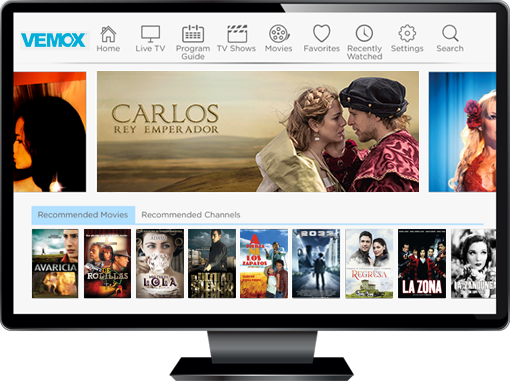 VEMOX provides access to the best Spanish-language and English-language content available – more than 100 live channels and 30,000+ hours of On Demand content. Our white-label OTT offering goes above and beyond to help target the 9.5 million U.S. Hispanic homes that do not have Pay-TV† with a unique slate of original programming that reaches a diverse demographic. †Source: Based on independent analysis of demographic and subscriber information provided to Olympusat.